2 to 5 minute short games with regular interaction between the coach and players to discuss positives and negatives that can be improved on. 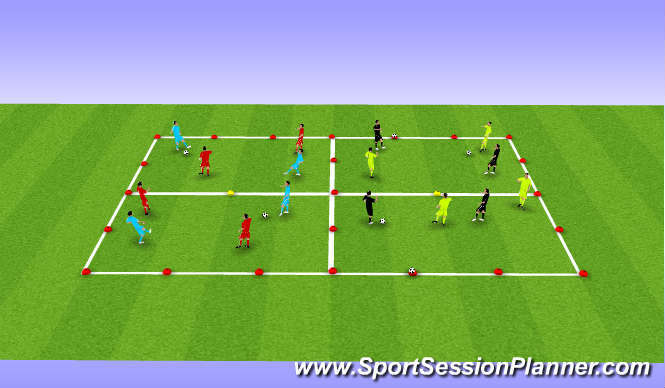 Link pitches together by removing cones or line restrictions to create 4 v 4 and add targets ie ball on cone that they have to knock off or small goals/no goalkeepers. Keep players in original square/pitch in defensive and attacking roles then allow one defender at a time to cross halfway line to create 3 v 2 overload in attacking areas. Finally open up playing area for full 4v4 game.